I had a hankering for some cheese blintzes. I realized that I would have to make them myself. I bought the ingredients over a week ago, but had been procrastinating a bit. Sometimes I wish that I could just buy ready made gluten free ones, but I have never seen these in the stores. 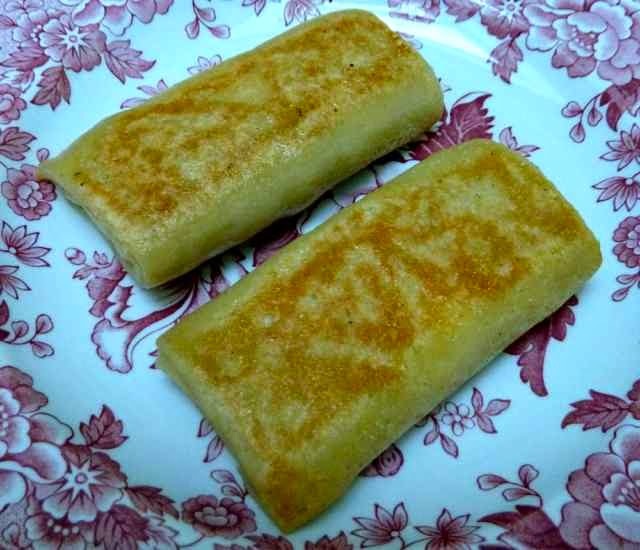 Blintzes are crepes filled with cheese, fruit, potato or cheese & fruit. The crepe is rolled up around the filling like an egg roll. 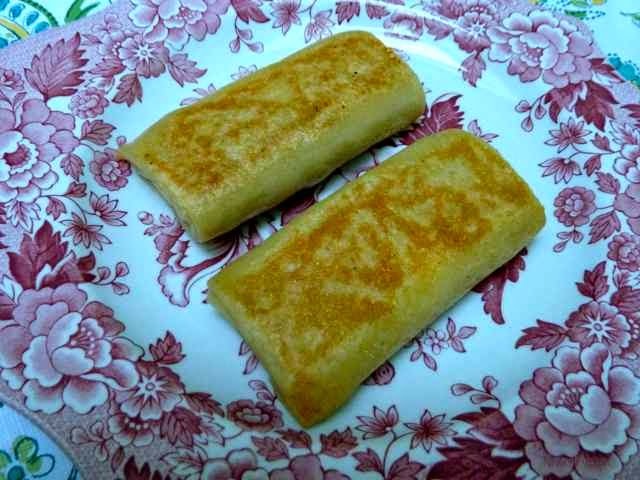 Then the rolled up ‘egg roll’ or blintz is browned in oil, margarine or butter and served with sour cream, applesauce or, in my case, yogurt and preserves. I followed a recipe for Ratner’s Blintzes. Ratner was a New York City deli that was famous for great blintzes. This deli is no longer open. I converted the crepe to a GF version. The filling has no gluten ingredients. I could not find Farmer’s Cheese so I used ricotta cheese. The filling came out delicious, but a bit runny. Farmer’s cheese is firmer and drier than ricotta cheese and if you use the farmer’s cheese the blintz filling is usually firm like the inside of a cheese Danish. With the ricotta cheese the filling flowed out when the blintz was cut open. I loved the texture of the crepe itself. It had just the stretchy, slightly chewy feel of what I remembered and no xanthan gum was necessary. I made savory crepes for my French Tea Party and, though tasty, they were difficult to make. 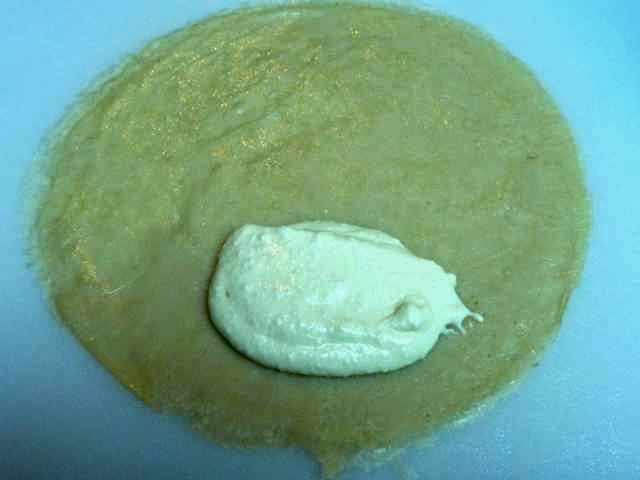 This sweet crepe batter was easy to spread over the pan and flip. The finished crepes were flexible and easy to transfer and work with, no tearing or breaking. Rolling up the crepes around the filling was easy to do also. I will be making these again and again. (This recipe made 17 crepes, but the filling was enough for 14 blintzes. Add the flours, sugar a salt to a bowl and mix well with a whisk. Set aside. 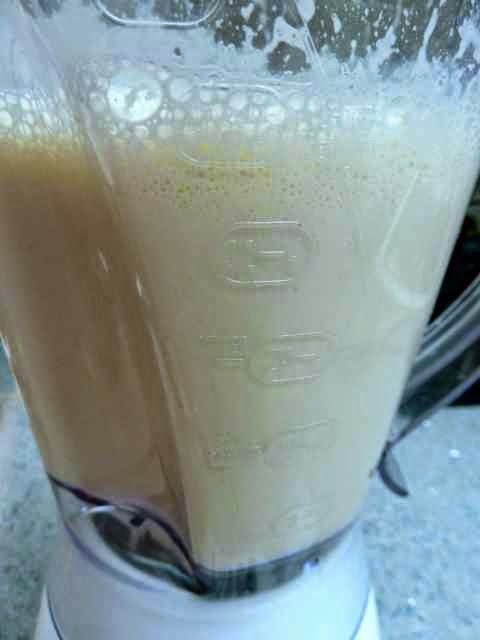 Add the eggs and milk or water to the blender container. Blend. Liquids mixed in the blender. 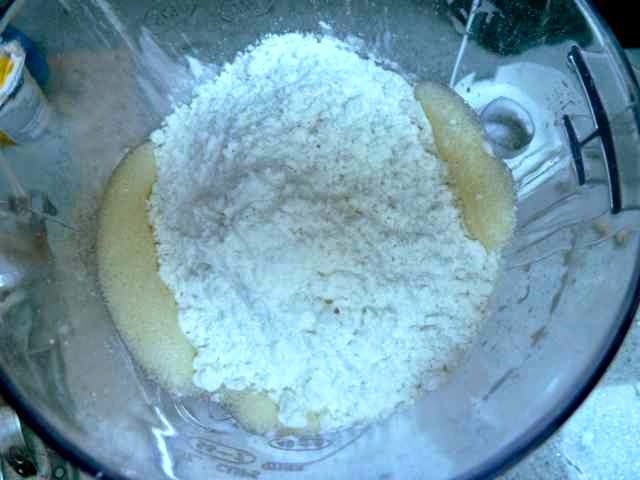 Add the flour mixture to the liquids in the blender and blend until smooth. Scrape down the sides if needed. Flour mixture added to the liquids. Batter all blended and smooth. Heat a 7, 8 or 9-inch crepe pan or non stick skillet over medium low flame. 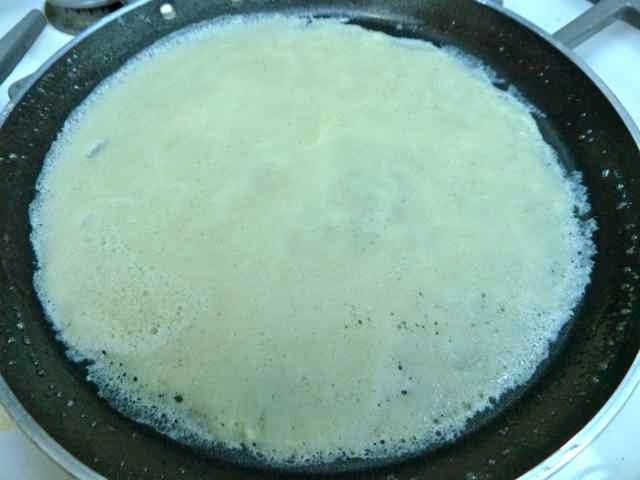 Grease the pan with butter, oil or margarine. Do not allow the pan to smoke or brown the grease. Crepe cooking in pan. Batter is still wet. Cook on the first side about 60-90 seconds or until dry. 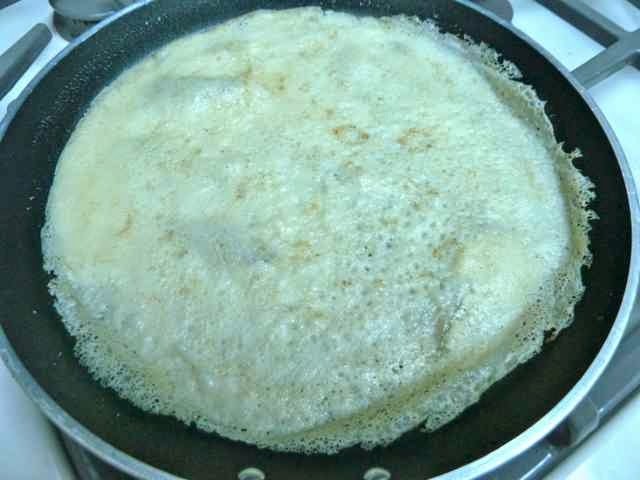 The batter is now dry on top and the crepe is ready to be flipped over. Flip the crepe and cook about 15 seconds on the second side. Slide or flip the crepe onto a piece of wax paper, parchment paper or plastic wrap. Repeat with the remaining batter. Separate the crepes between pieces of wax paper, parchment paper or plastic wrap so that they do not stick to each other. 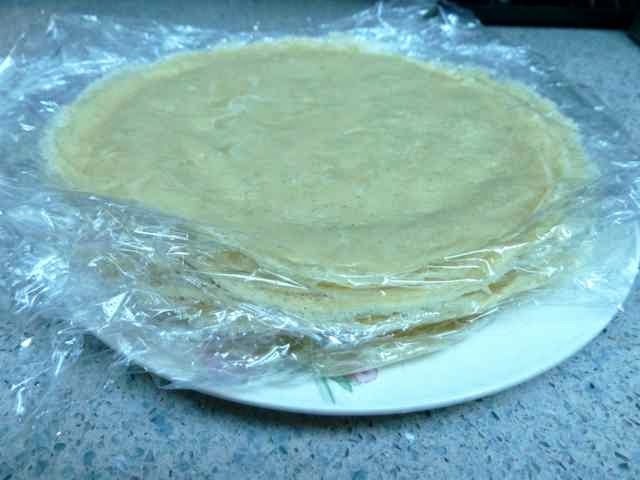 Pile of finished crepes between pieces of plastic wrap. Mix all the ingredients together in a small bowl. Set aside. Place one crepe or blintz on a cutting board or clean counter. The side that cooked for 15 seconds should be facing up. Place 2 Tbs. of the filling on the bottom of the crepe leaving 1-inch of space from the bottom edge. 2 Tbs. of filling on bottom of crepe with about and inch of space. Fold the bottom of the crepe over the filling, encapsulating the filling. 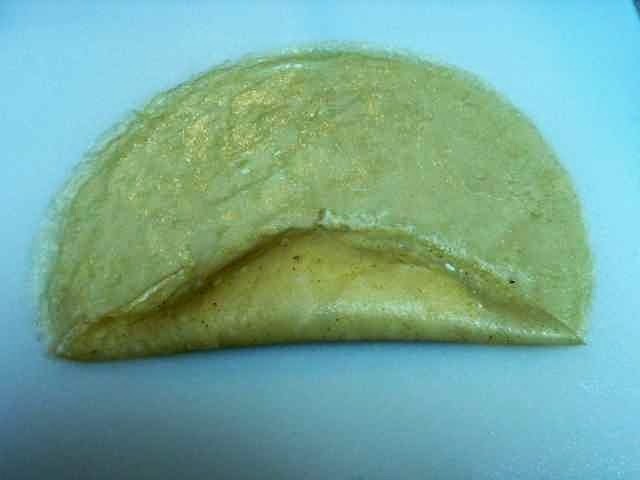 Bottom of crepe filed up over the filling, encapsulating it. 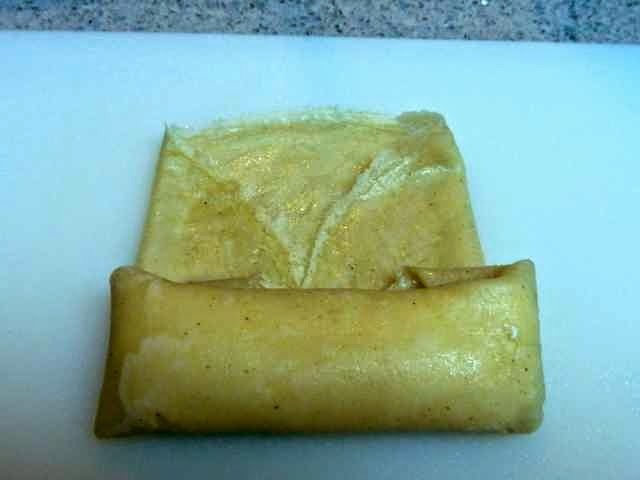 Fold one side of the crepe over, like you are making an egg roll or burrito. Then fold the other side of the crepe. Both sided folded over like an egg roll or burrito. Roll the bottom up to the end of the crepe. Beginning to roll up the blintz. 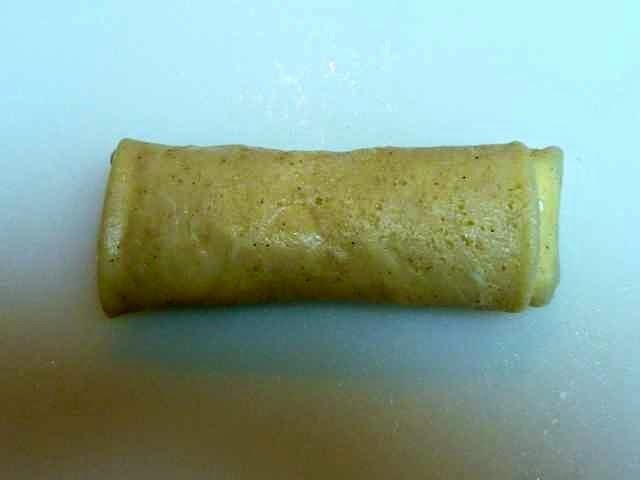 Place the finished blintz on a plate, seam side down, to keep it from unrolling. 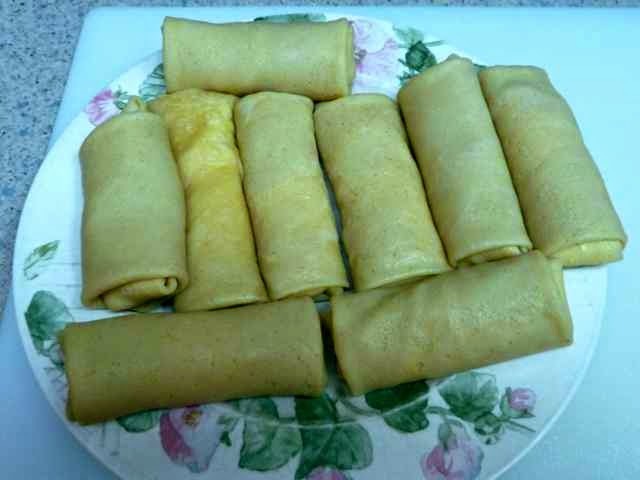 Assembled blintzes on a plate. When ready to eat, heat oil, butter or margarine in a skillet over a low to medium flame. Do not allow the grease to smoke or burn. Cook 3-4 blintzes at a time to allow room to flip them over. Place the blintzes seam side down. Cook about 1-2 minutes or until the bottom in golden brown and crisp. Then flip the blintzes over and cook the other side. When the other side is golden brown remove the blintzes from the pan. Blintzes cooking in the non stick pan. The seam side is browned to my liking. Some people like it more golden and crisp. Serve with sour cream, apple sauce, preserves or fruit. Some people use maple syrup or whipped cream. Uncooked blintzes will keep about 36 hours in the fridge. You can freeze the assembled, but uncooked, blintzes for later use. Heat the frozen blintzes on low heat browning both sides until golden and crisp and the filling is warmed through. GLUTEN FREE CHEESE BLINTZES Makes about 14 (This recipe made 17 crepes, but the filling was enough for 14 blintzes. I made dessert crepes with the left over crepes.) Ingredients CREPES 1¼ cup Tapioca Flour ½ cup White Rice Flour - Superfine Ground (or Sweet Rice Flour) ¼ cup Sorghum Flour ¼ cup Sugar ¼ tsp. Sea Salt 4 large Eggs 2 cup Water or Milk (I used almond milk.) FILLING 1 lb. Farmer’s Cheese (You can use Ricotta Cheese if you cannot find Farmer’s Cheese, but the filling will be runny and not firm.) 2 large Egg Yolks 3 Tbs. Sugar 1 tsp. Vanilla Extract Directions CREPES or BLINTZES Add the flours, sugar a salt to a bowl and mix well with a whisk. Set aside. Add the eggs and milk or water to the blender container. Blend. 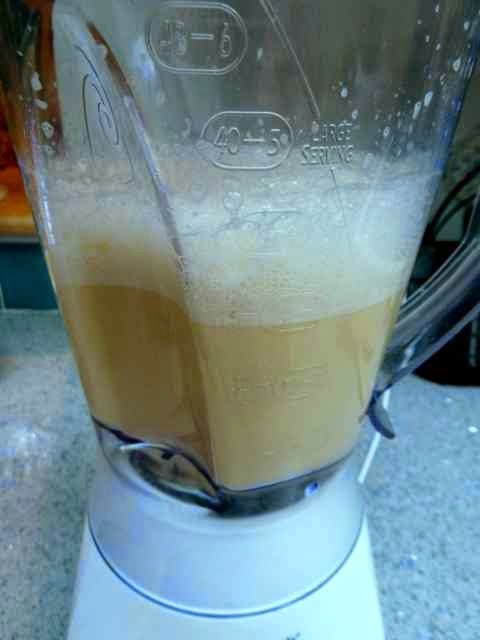 Add the flour mixture to the liquids in the blender and blend until smooth. Scrape down the sides if needed. Heat a 7, 8 or 9-inch crepe pan or non stick skillet over medium low flame. Grease the pan with butter, oil or margarine. Do not allow the pan to smoke or brown the grease. (Clean the pan and start over if the grease burns.) 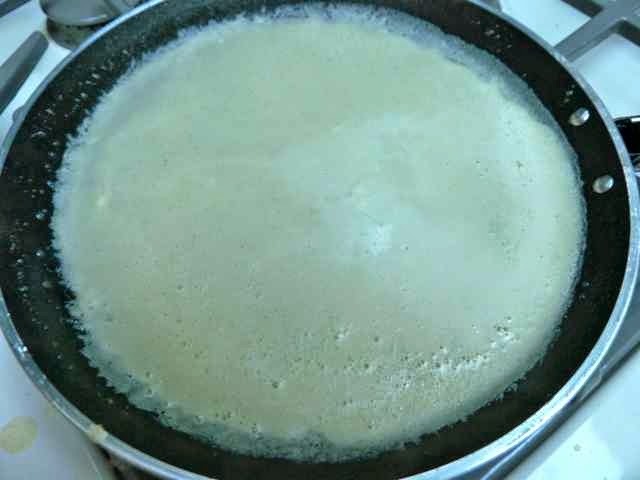 Pour ¼ cup of the batter onto the hot pan. Tilt the pan and swirl the batter so that the batter spreads evenly over the bottom of the pan. You can patch holes with drops of batter if needed. The crepes should be about ⅛-inch thick. Cook on the first side about 60-90 seconds or until dry. Flip the crepes and cook about 15 seconds on the second side. 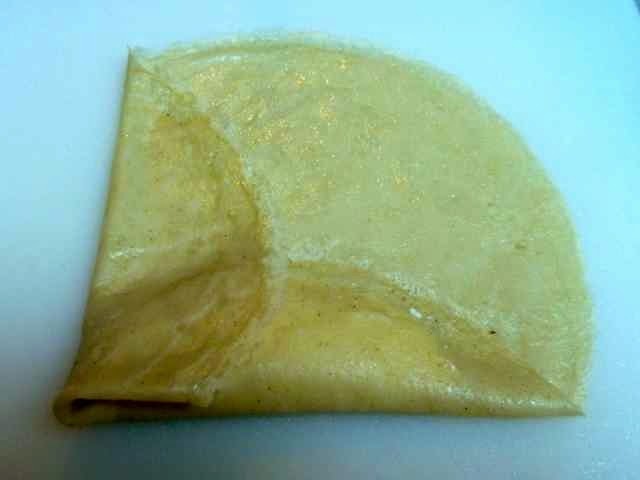 Slide or flip the crepe onto a piece of wax paper, parchment paper or plastic wrap. Repeat with the remaining batter. Separate the crepes between pieces of wax paper, parchment paper or plastic wrap so that they do not stick to each other. FILLING Mix all the ingredients together in a small bowl. Set aside. ASSEMBLING THE BLINTZES Place one crepe or blintz on a cutting board or clean counter. The side that cooked for 15 seconds should be facing up. Place 2 Tbs. of the filling on the bottom of the crepe leaving 1-inch of space from the bottom edge. Fold the bottom of the crepe over the filling, encapsulating the filling. Fold one side of the crepe over, like you are making an egg roll or burrito. Then fold the other side of the crepe. Roll the bottom up to the end of the crepe. 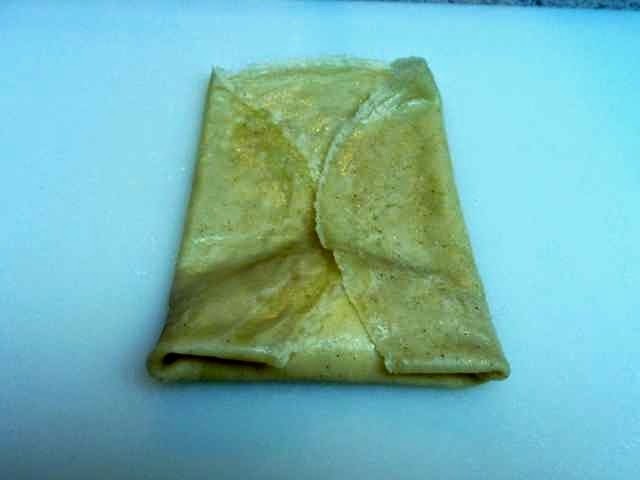 Place the finished blintz on a plate, seam side down, to keep it from unrolling. Repeat until all the filling is used. COOKING THE BLINTZES When ready to eat, heat oil, butter or margarine in a skillet over a low to medium flame. Do not allow the grease to smoke or burn. 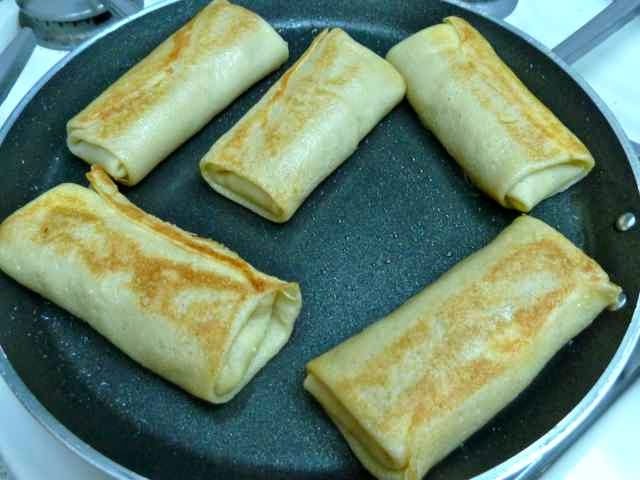 Cook 3-4 blintzes at a time to allow room to flip them over. Place the blintzes seam side down. Cook about 1-2 minutes or until the bottom in golden brown and crisp. Then flip the blintzes over and cook the other side. When the other side is golden brown remove the blintzes from the pan. Serve with sour cream, apple sauce, preserves or fruit. Some people use maple syrup or whipped cream. Uncooked blintzes will keep about 36 hours in the fridge. You can freeze the assembled, but uncooked, blintzes for later use. Heat the frozen blintzes on low heat browning both sides until golden and crisp and the filling is warmed through.